One of the classic moments in cinematic horror. Too bad the rest of the film can't match it. 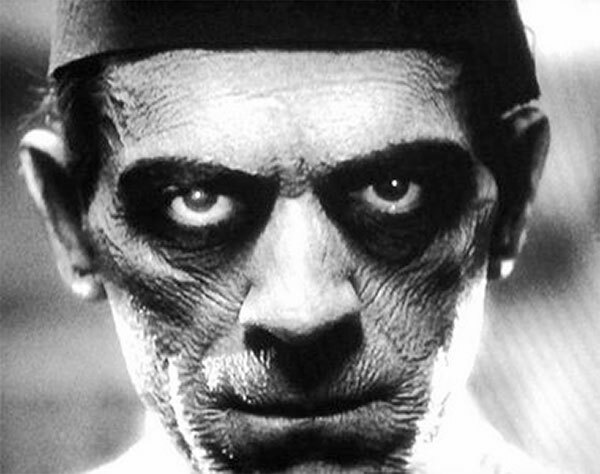 Perhaps the most frustrating "biggie" of the classic Universal horror cycle, THE MUMMY gives the viewer a '30's-style "weird tale" fused with what would become the template for nearly every mummy to follow. That is not a bad thing, but the film itself has much in common with DRACULA (1931) in that it moves at the pace of a drugged Brontosaurus, features a character who may as well be Van Helsing (and is played by the same actor), and works quite well as a soporific for modern audiences. Though thick with Hollywood "Egyptian" atmosphere, the film is more of an eerie love story with no scares, save for the memorable sequence that opens the narrative. 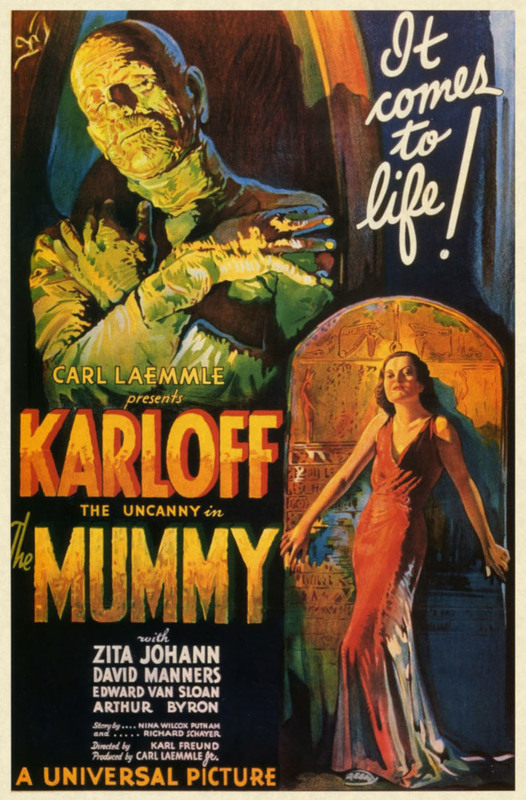 The film opens in Egypt in 1921, as a British expedition has unearthed an ancient tomb containing numerous artifacts, including a heavy box and an unusually well-preserved mummy whose internal organs were not removed, which would have been the standard procedure. The local expert on such matters warns the members of the expedition that it appears they have found the box containing the scroll of Thoth, a document used by Isis to restore Osiris to life, and that opening the box would bring down a horrible curse upon those involved. 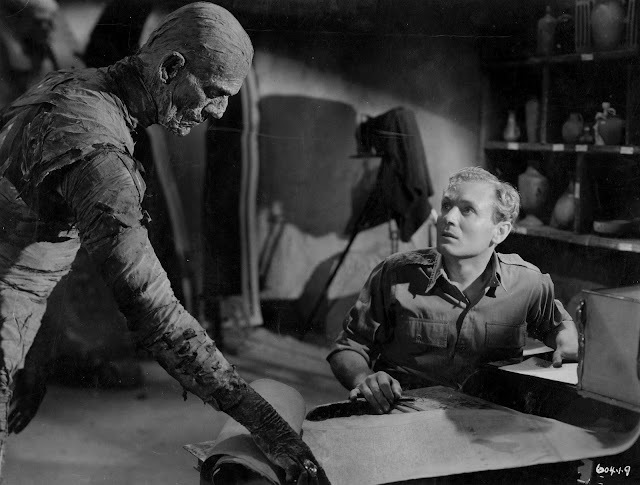 While the expedition's leader leaves the tomb to discuss these matters with the expert, the leader's underling remains in the tomb and reads the scroll aloud, unwittingly bringing the mummy — determined to be Imhotep, once a high priest who was sentenced to live mummification after engaging in forbidden, blasphemous acts in the name of love — to life. The bandaged revenant shambles out of his sarcophagus and retrieves the scroll from the underling, who, upon seeing this thing that simply should not be, instantly succumbs to a state of gibbering madness (from which he later dies). With his prize in hand, Imhotep (Boris Karloff), takes his leave and vanishes for the next decade. That sequence is indelible, a true triumph of old school horror at its most subtle and riveting, thus it is a great shame that the rest of the film immediately thereafter devolves into a turgid and tepid potboiler. Imhotep resurfaces in 1932, now living as Ardath Bey, and shows a new expedition where to find the tomb of his lost love, the princess Ankh-es-en-amon. He also encounters a young woman who bears a striking resemblance to the princess and is apparently her reincarnation, so he sets about using his sorcerous powers to murder and hypnotize those who would stand in the way of him killing, mummifying, and reviving her to become his immortal consort. The hypnotic visage of Ardath Bey. If you've ever seen a mummy movie, you know how all of this hashes out, but after making it all the way through the film's 73-minute running time, you'll realize that despite being the grand-daddy of all mummy flicks, we only see the bandaged, shambling mummy for about thirty seconds at the beginning of the film. Unlike later entries, at no point do we get the stalking strangler wrapped in linen that would later come to define the trope/archetype. What we get instead is the admittedly more interesting immortal sorcerer Ardath Bey, whose relentless evil is solely motivated by love, and when his face is seen in closeup, the stunning makeup work of the legendary Jack Pierce is displayed to great effect. The brief glimpses of the fully-mummified form of the high priest are also amazing and have since become iconic, though those who have not seen the film would never guess that it is only seen onscreen for less than a minute. Though it does not live up to one's preconceived notions as based upon the films that followed in its wake, I admit to having a soft spot for THE MUMMY. Though slow-moving, its weird love story angle is engaging and rather sad, with that sadness being one of the hallmarks of the Universal horror flavor. Its monsters all bear some form of tragedy, and Imhotep's particular misery is all-too-relatable. That said, I say give THE MUMMY a shot at least once. It's a landmark for a reason, though it admittedly may not hold up for the majority of modern audiences.